Can This Actually Be Fun? Isn't Being On Vacation Supposed To Be An Excuse To Splurge? There's room for both splurging and traveling frugally in my life. Splurging is fine for a 2-week holiday and, like everyone else, we like to have those too — once in a while. But imagine splurging for five or six months at a time. We would be eating into our retirement fund pretty quickly. It's not in our budget and that's not what this web site is about. On this page I'll show you the advantages of traveling frugally in realistic terms. A two-week holiday is a vacation and can allow for some splurging. A five or six-month trip is a lifestyle choice. For us, these longer trips are only possible by traveling frugally. We shop around for the best price on everything we purchase, just as we do in our “at home” life. Because we do this, we're able to experience the adventure and joy of traveling yet spend very little more than it costs to live at home. The reality for us is that, if we weren't traveling frugally, we'd not be traveling as often or for the length of time that we do. Life is too short to spend more time working than playing. The balance for us comes when we “take off” every two years for several months at a time. We couldn't do this if we weren't traveling frugally. So, how little can you spend and still get to see and do everything you want? The answer to that will, of course, be different for everyone. I can only tell you how we've done it and that we'll continue traveling frugally in this way for as long and as often as we can. Why? Because it's fun, it's adventurous, it's romantic and it's cheap. On our seven longest RV trips, I kept close track, recording every expense. To show you how possible and how affordable traveling frugally by RV can be -- our way – I'll share with you exactly how much each trip cost and where we allocated every penny we spent on those six trips. When we plan a long road trip we plan on traveling frugally. We develop a budget for each trip and track every expense. I use a simple spread sheet program to enter and categorize every purchase. As of 2013, we budget from $600.00 to $800.00 per person per month for our travels. This includes all expenses of our trip including food and personal items that we'd be purchasing even if we were staying home. And, as you'll see from our records below, we don't hold back on mileage. We're not traveling to go and sit in one spot. We're going to see and experience as much as we can at a pace that keeps the trip relaxing but, at the same time, exciting and spontaneous. What does it cost to travel this way and where's the money spent? The following is a brief synopsis of our expenses on our seven longest RV trips and includes all expenses for two people. The figures reflect only our actual trip expenses. Other related costs of buying, insuring and maintaining the RV while not on the trips are not included. We use it as our second vehicle and would have that expense even if it wasn't an RV. The breakdown is in US dollars, but line 12 provides the Canadian dollar equivalent. If, after reviewing our costs, you're still skeptical, take a look at the budget of full time adventurers, Mark and Emily. Route: A direct route from Ontario to southern Arizona in March. In April and May meandering through California on the desert (east) side of the Sierra Nevada Mountain range - at a leisurely pace. By June we turned east, returning slowly with stops in Nevada, Idaho, Wyoming, the Dakotas, Wisconsen, Minnisota, and Michigan. Although we put on lots of miles, we covered less territory over a longer time period, making this one of our most relaxed and enjoyable extended trips ever. Route: From Ontario, to Quebec, around the Gaspe Peninsula, New Brunswick, Prince Edward Island, and Nova Scotia, including Cape Breton Island, we followed secondary roads and the coastline almost exclusively until returning to Ontario from New Brunswick with a more direct route. We only camped 3 nights in a campground. The remaining nights, divided fairly equally between Boondockers Welcome hosts, boondocking spots, and on friends' property. Route: From Ontario, to Arizona (first time attending Quartzsite's RV Show), a few weeks in Southern California, and two full months criss-crossing New Mexico, reviewing and adding locations to my guide. 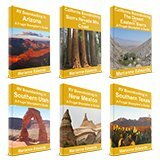 Route: From Ontario, to Florida (including 3 days at Disney World), Texas, Arizona, and Utah with extensive travel through each of these four states for the purpose of reviewing all sites listed in my Frugal Shunpiker's Guides. Our Canadian to US dollar avg exchange rate (2013) was at par. Route: From Ontario, to Texas and New Mexico, then through Arizona to California. Extensive travel in California including the deserts, coastal highway, and the Sierra Nevada Mountains with stops in Nevada and Colorado on the trip home. Our Canadian to US dollar avg exchange rate (2011) was at par. Route: From Ontario, south to Texas, west to Arizona, north to Utah, extensive travel in New Mexico, north to Colorado and back to Ontario. Our Canadian to US dollar avg exchange rate (2008) was at par. Route: From Ontario, south to Texas, Arizona, California, Utah and return to Ontario via North Dakota and Manitoba. Route: From Ontario, south to Texas, west through New Mexico, Arizona, north to Utah and Colorado and back to Ontario. Route: From northern Ontario into the northern States. West through the Dakotas and Wyoming. South into Utah, California, Arizona, and Texas. East to Washington D.C. and back through Pennsylvania to Ontario. And The Best News Is…You Can Do It Even Cheaper! The following will help you understand the expense reports line by line. Title Line –Yes, we name our trips. It's part of the fun, gives each trip a “personality” and makes it easy to refer to them without using the dates as a reference. Who wants to be remembered by a number? Line 1 – Distance Traveled. We believe in shunpiking and don't go anywhere the direct route. We're spontaneous; sometimes going backwards or in circles if we hear of something we've missed along the way. We've also put on a lot of extra miles on our trips in search of the "perfect free camping area" so that you don't have to. $$$ Spend even less: You could do a similar trip, and cut back on the miles quite a bit if you followed my Frugal Shunpiker's Guides to free camping and the routes suggested in the guides. Line 2 – Gas Cost. Canadians should note that gas is significantly cheaper in the USA. Click here for an easy formula to calculate your exact gas cost savings when you travel in the States. If you drive a newer vehicle than we do, or any vehicle that gets better gas mileage, you could $$$ spend less on gas than we do. We also don't have a tow vehicle, which could make local day trips more economical. Line 3 - Average Gas Cost per kilometer or per mile - calculated over the course of the trip. Line 4- Camping Fees. No you aren't reading it wrong and the decimal is not out of place. We really spend very little on camping. The Frugal Shunpiker's Guides will direct you to every campsite we found on the seven trips in the examples above. Note that, while nearly every other category of expense increased gradually over our 15 years of traveling, our camping costs have remained stable. If we had stayed at pay campgrounds every night, even at an average of $15.00 per night (low estimate) we would have needed to budget an additional $450.00 per month, increasing each trip's total expense between 30% to 50%. Line 5 - Food. What do you spend in groceries per month? Traveling frugally doesn't mean we don't eat well. Seeing as we usually end up gaining a few pounds, we probably eat more than at home. We like to barbecue and carry a portable propane grill. Our food bill includes beef, chicken, or fish almost daily. We also try to eat healthy. Fresh fruits and vegetables are a daily must. Allowing for personal preferences, I think anyone can eat well on the amount we spend by doing what we do: knowing and comparing prices, buying what's in season, and shopping the specials. Line 6 - Entertainment. Entertainment is always a big part of traveling. Even when traveling frugally the whole idea is to have fun, otherwise you might as well stay home. Line 6 includes all our entry fees to attractions, our few splurge nights out at a restaurant, a glass of wine with dinner or a beer after a hike. If you don't drink alcohol, chances are you'll end up $$$ spending less. We keep our entertainment budget somewhat in check by considering carefully what we're really interested in. Traveling frugally means avoiding the “tourist traps” but when there's something that an area is famous for, that can't be seen anywhere else,—I mean, come on, we've come all this way! It would be crazy to miss out. For the most part, our favorite kind of entertainment fits right in with the concept of traveling frugally. A day spent hiking a new trail, followed by a quiet meal together or shared with new friends, and perhaps an evening campfire or a stroll under a starry sky. Line 7 - Vehicle Repairs. 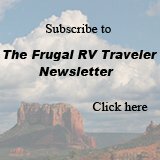 You may be able to improve your budget and $$$ spend less in this area if you're driving something that won't need as much maintenance as our older RV. To avoid too many “surprises” on the trips, we do have our RV checked out by our mechanic before we start on a big trip. We carry a good set of tools and the Hanes manual. We're lucky that Randy is mechanically minded and patient, but we also find that invariably people we meet along the way are very helpful when it comes to sharing tools and knowledge. Full disclosure: All repairs except for two major ones (each in excess of $1500.00) that happened on two separate trips are included in this report. They are left out to make it easier to compare actual trip cost over the years. Major repairs, while not pleasant, can be expected when driving an older vehicle as we do and could just as easily have occurred at home rather than on one of these trips. Line 8 - Internet Service. (Added as of 2011) With two web sites to maintain, we now purchase a monthly Verizon data plan when we travel. Most travelers don't need this. Up until 2011, we managed just fine with free wi-fi which is now available at more and more locations. Libaries are a very reliable source for it. Line 9 - Miscellaneous. - This includes all the expenses not listed separately --propane, laundry, pay showers, toiletries, cleaning supplies, etc., etc.” that we seem to think we need to live as comfortably as we do at home. This line should also include RV Dump Fees, except that we almost always manage to avoid them. They're getting harder to find but, usually we use free RV dumps. And yes, the locations are all listed in (you guessed it) the Frugal Shunpiker's Guides. Line 10 - Extended Health Insurance. As Canadians, we have universal health care but it only covers the amount the procedure would have cost at home. That's one area where prices are far higher in the USA so all Canadians are advised to buy extended health insurance when traveling outside their home province. Traveling frugally is not an excuse to cut this expense. Not purchasing this insurance could easily cost you all your hard earned assets and savings if you got sick or had an accident. Lines 11, 12 and 13 -Total Expenses. -Since the figures in this report are in Canadian dollars, I've calculated the US equivalent using the average exchange rates over the months of each trip. Traveling frugally, we can go farther on our budget in the States than Canada. Americans often pay nearly 20% less for gas than Canadians. Perhaps, one day we'll come up with a viable alternative to the combustion engine or a more-affordable fuel. Even when crossing our own country, we can often save quite a bit by driving below the border, choosing a route through The States. I have a hard time advocating travel in Canada sometimes especially on a site that's dedicated to traveling frugally.